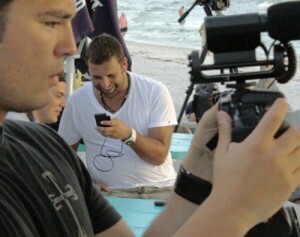 Phil had a great meetup shooting time lapse of the setting sun and clouds over the beach at St. Petersburg, FL. I just got this Canon T2i and didn’t have an intervalometer so I took my monopod and grabbed shots of the beach and the people who showed up. Shot with Canon T2i using 17-55mm kit lens. First time I’ve shot people or much anything other than test shots with this camera. I took some stills but must have hit a weird selection on the camera as they did not turn out well. My test stills at the house looked great so I’ll have to see what I screwed up. The camera behaved pretty well. The biggest issue is focusing the kit lens. It’s way sensitive to the touch and takes just a bit of movement to throw the focus in or out. Other than having to shift from the controls on my Nikon D90, that was the only thing that felt strange. The LCD viewfinder through my Hoodman Loupe looked great. I did feel a bit “under-dressed” as everyone else was shooting Canon 5D and 7D cameras with gorgeous lenses. My little T2i with the kit lens doesn’t carry much street cred. But I relaxed and started connecting with people, getting shots here and there. Everyone was having a good time and enjoying the great weather on the beach. It was very windy and, even though I had a good wind muff on my recorder, most of the audio was filled with so much low end woof from the wind it was not usable. I managed to find enough background crowd noise without too much rumble to fill in the atmospheric tone. A few of the backlit shots needed a bit of grading to pull up the faces. Some of the shots with the sun almost setting were so golden and warm that they looked like they’d been heavily graded so I pulled those down a bit. Otherwise, the footage is straight from the camera, through Magic Bullet Grinder and into Final Cut. I dropped a track together in Apple Logic to set the pace for the edits then came back and added some fun bass and vocal lines. Thanks for Phil for putting this together. If you ever get the chance, make the effort to get to one of his meetups, it was a lot of fun meeting everyone. Yep, they really do ring that bell every night just as the sun slips below the horizon. Great place to visit when you’re in Florida. Here’s a link to more video with some time lapse from one of the guys at the meetup. well done, it was nice meeting you guys. It was a pleasure meeting you and Juliana. Thanks for the link, Chad. I look forward to connecting again in the future. That was a lot of fun! I was there along side ya with my timelapse set up. Great job on the edit of that clip there! Looked great and the edit was superb! Thanks Tom, it was fun – is your timelapse online? Previous post: Canon T2i and Magic Bullet Grinder – Perfect!